The boss of the Serious Fraud Office has warned rogue bankers will be brought to justice with more individuals involved in rigging Libor interest rates likely to be charged this autumn. 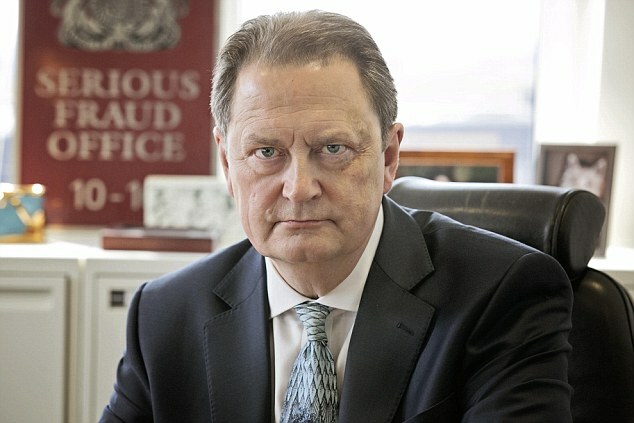 In a speech yesterday, David Green (pictured) indicated there would be no hiding place for anyone involved in the scam – no matter how senior – saying the watchdog’s Libor probe will ‘go wherever the evidence takes us’. The comments were made in Green’s first public speech since former UBS and Citigroup trader Tom Hayes was convicted for manipulating Libor and sentenced to 13 years in jail. Speaking to an audience of police, lawyers and regulators at the Cambridge Economic Crime Symposium at Jesus College, Cambridge University, Green referred to the conviction, describing Hayes as ‘a ringmaster in the manipulation of Libor’. Hayes had admitted manipulating Libor interest rates but said this was known about and sanctioned by senior bosses at both Citigroup and UBS. Green said the defence that rate-rigging was standard industry practice would not stand. He said: ‘The verdicts made the point that bankers are subject to the same standards of honesty as the rest of us. ‘Alleged industry practice, arguments about “permissible range”, “no one told me not to” and “why pick on me?” provide no defence in law. Dismissing criticism that Hayes’s sentence was too strict, he said: ‘It was a very good result for the City, the banking sector and the market.’ The SFO launched its probe into Libor in July 2012, shortly after Barclays was fined £290m for the scandal. A string of lenders, including Royal Bank of Scotland, HSBC and Lloyds have also received huge fines – with dozens of traders suspended. Green said ‘more charges are likely this autumn’. More than seven years after the onset financial crisis not a single senior banker has been jailed. The next trial begins at October 5 at Southern Crown court – with six interdealer brokers accused of helping bank traders push Libor rates up and down.